This is another shot of flying the sails wing-on-wing. To do this you put the main sail on one side and the headsail on the other and carefully steer the boat so the wind is exactly behind you. It takes a bit of concentration but looks lovely when you get it right. This is a different type of sail trim. 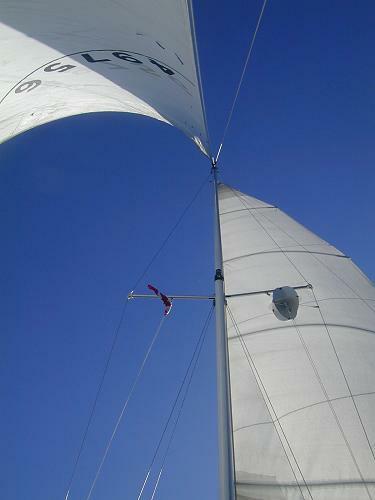 Here we have the mainsail with a reef in it (to reduce it's size) and we only have a small portion of the headsail out. 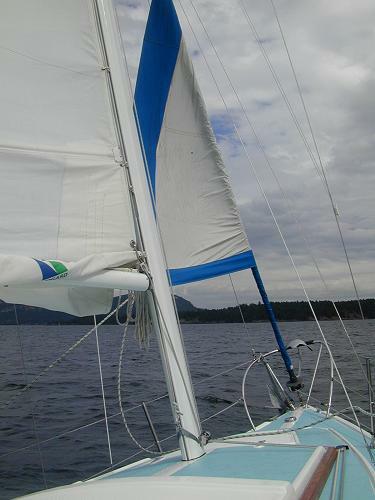 The wind was probably blowing about 20 knots and we didn't want to overpower the boat, so we reduced sail. We were still making 7 knots - even with the sails reduced. Here is a shot of Craig looking tough manning the tiller on our windy day. 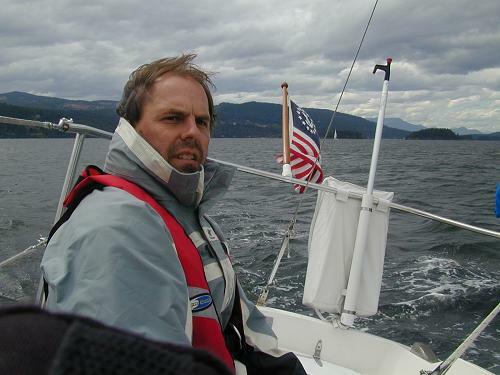 It was fun having someone aboard who knew a lot about sailing. He was eager to sail so I was able to focus on navigation, get projects done, and generally just relax. Well, not all the beaches were this empty but much of the Gulf Island were fairly unpopulated. We were there right at the end of the high season. I expect to see fewer boats as it gets later in the year. 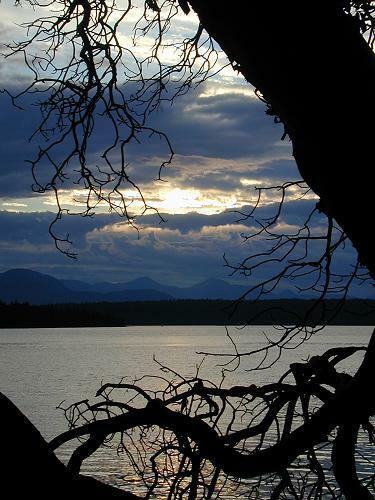 This is a photo from the north side of Montague Harbor on Galiano Island. 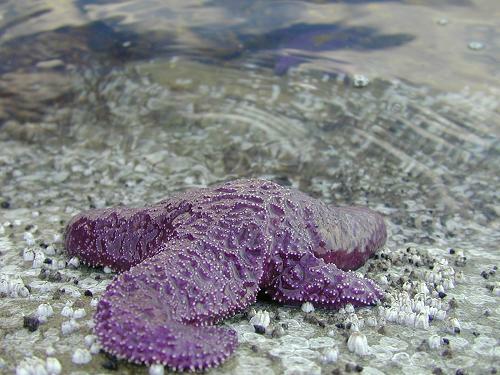 I'm not sure this sea star is ocher but that's the name. According to my guidebook, they come in many colors. Most of the ones we saw were purple. At low tide they covered the rocks. 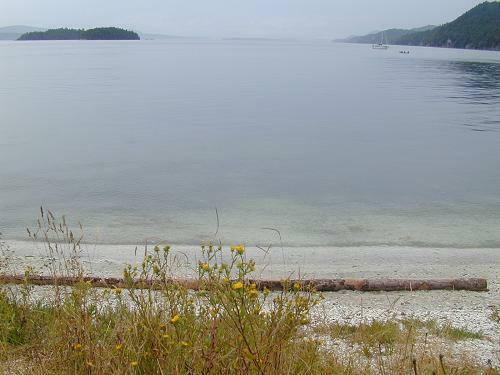 While we were on Wallace Island, the weather changed from sunny every day to cloudy with light sprinkles on and off. However, with the change in weather we got good winds and would often make our destination after only sailing for a few hours. In many anchorages, there is not enough room for all the boats to put out anchors. When you have an anchor out, your boat swings in a circle depending on the winds or currents. In a small harbor there is not enough room to let everyone swing, so boats tie their sterns to shore. This keeps them in one place and actually makes for a fairly comfortable night. 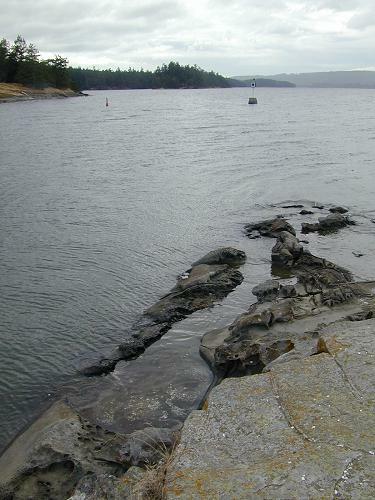 Plus, you have two lines attached to the boat to keep it off the rocks (assuming you checked your tide tables). With the 14 foot tides in this area, if you are not careful, you could wake up to find your boat sitting on the bottom. 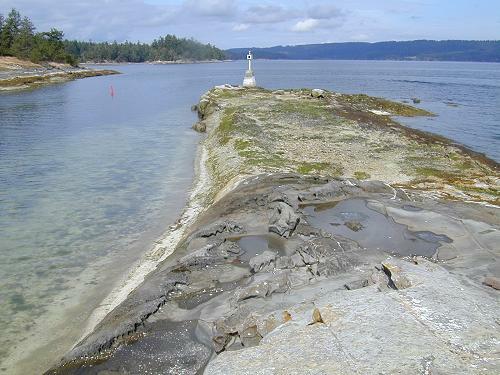 There are many tricky passages in the Gulf Islands and the entrance to Pirate's Cove on De Courcy Island is one of them. Deceptive at high tide, it's important to line your boat up carefully as you enter or you could end up on the reef. This is a photo of the same reef at low tide. Notice the shoal and how narrow the entrance really is. On board I have paper charts, digital charts on my GPS and laptop, and two guidebooks. After spending a small fortune on Gata Luna's bottom, I want to make sure it stays intact. After we left Pirate's cove we went through Dodd Narrows (currents can be up to 7 knots so you need to go through during slack water). 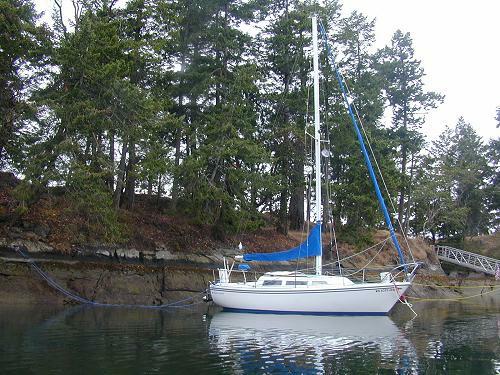 Just around the corner from Dodd narrows is the town of Nanaimo where Craig gets off and Karen comes on board. Next up - across the Strait of Georgia to the Sunshine Coast and Desolation Sound.